Konos! - San Diego Dining Dish! And we go from the expensive to the ultra cheap. Seriously, Konos prides themselves on a cheap, big breakfast. They deliver on both counts, and it's pretty tasty! Located in Pacific Beach right on the boardwalk, it can become very busy. Each time I've been there, the line has been out the door, but it moves quite quickly, as their service is efficient. Surfers and locals dine on their big breakfast burritos filled with eggs, home fries, salsa, avocados, bacon, and chili peppers. They offer pancakes and French toast, "big breakfasts" consisting of eggs, bacon, toast, etc., but the winner is the burritos. So good, and enough food for two people (unless you're really, really hungry). They also offer coffee drinks from a separate stand, which can be confusing. I wouldn't have known to get coffee there if I hadn't gone with some native San Diegans that knew the drill. The Mexican hot chocolate was wonderful, and made up for my confusion. 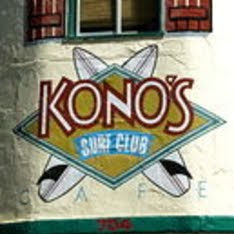 When the weather is nice (and it usually is in San Diego), Konos offers beachfront dining! It can be a little windy, but the view is spectacular. Lunch is the same schtick: big portions of staples like burgers and fries, cobb salads, all served in an inviting atmosphere with an ocean view! Some may be turned off by waiting in line and the food served in a basket with plastic utensils, but when the average meal is around 5.50 US, well, it's hard to beat! My name is Eleanor Strickland I was browsing internet and found your blog. The author did a great job. I will subscribe to your RSS feeds. Thank you for your contribution. I am a web designer myself. And here some examples of the websites that I designed for canadian payday loans payday loans in canada company.